Duplicate prevention upon manual entry in Salesforce classic shows the actual potential duplicates in the native entry page. If you are using the Lightning version of Salesforce please navigate to this article. 1.2 At *Object* Setup navigate to the particular object you want to enable prevention upon manual entry for. 1.3 Navigate to the *Object* scenario tab and make sure that you have applied a scenario to the Manual Insert Prevention and Manual Update Prevention. Check the example image below. Note: Make sure that the applied scenario to Manual Insert Prevention and Manual Update Prevention contains the fields you desire to use in comparing your records with your existing data. Learn more about scenarios and how to configure them in this article. 1.4 Creating a new record in your salesforce environment now automatically triggers the duplicate prevention and shows you the results. 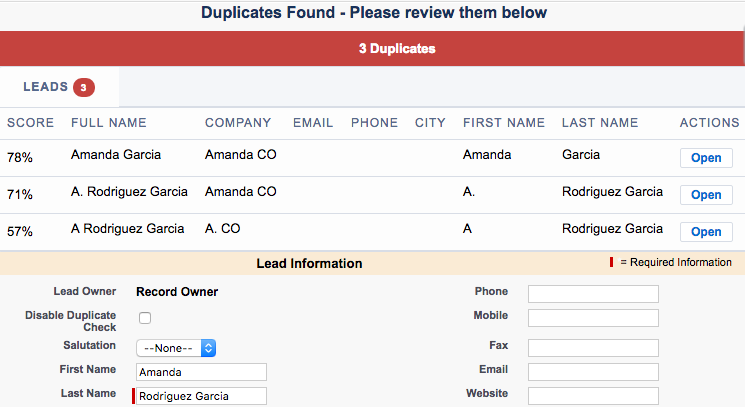 1.5 If the new entry record is shown as a duplicate, but you consider it as a fake duplicate, for example the record can be a family member or relative and not a duplicate, simply allow the creation of the record by disabling the Duplicate entry prevention by checking the Disable Duplicate Check check box. If the check box is not added to the page layout, please read this article.